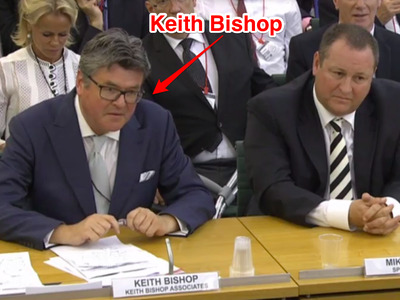 Business Insider/Parliament TVKeith Bishop alongside Mike Ashley. Reclusive Sports Direct billionaire Mike Ashley made a rare public appearance on Tuesday to answer MPs questions about working conditions at his warehouses. But the man sat alongside him at the inquiry was no less interesting, according to his online biography. Mike Ashley’s PR man Keith Bishop is nicknamed “The Bishop” and has clients and friend that include “everyone from archaeologists to zoologists”, according to his firm’s website. He counts as his friends and clients everyone from archaeologists to zoologists with just about every possible profession inbetween, while he inspires a fierce loyalty, admiration, and affection, even in such a cut-throat and instantly changeable industry as ours. Keith Bishop Associates has an extensive listed of low-level celebrity clients, including model Alicia Douvall, former England manager Sven Goran Eriksson’s ex-wife Nancy Dell’Olio, and chef Aldo Zilli. He also handles PR matters for many brands owned by Ashley and Sports Direct, including outdoor clothing company Karrimor, Slazenger, and Sondico, as well as doing external PR for Ashley’s recently relegated football team, Newcastle United. The agency, which is headquartered on Dean Street in London, is 51% owned by Sports Direct and 49% owned by Keith Bishop himself. Prior to turning to PR, Bishop worked for the BBC for more than 15 years. According to his LinkedIn profile, he was the Head of Program Publicity and chief assistant to the BBC’s General Manager for 17 years. For five years in the late 80s and early 90s, he worked as an administrator for the Foreign and Commonwealth Office. Bishop probably has one of the hardest jobs in the world of corporate communications, representing a man who is famed for his dislike of speaking to the media and reclusive nature. Sitting next to Ashley throughout his 90-minute long appearance at the BIS Select Committee, Bishop was asked by Ashley if he thought the tycoon was “kind,” and at the end of the hearing, unsuccessfully tried to stop Ashley from answering a question about whether or not he had wanted to buy BHS. Bishop has steered Ashley and Sports Direct through a series of scandals in the past couple of years, including the Guardian investigation which led to Tuesday’s inquiry, Ashley giving his daughter’s boyfriend a cushy job, and an alleged lawsuit against the Sports Direct founder for apparently reneging on a £15 million bet made in a London pub after a “considerable amount of alcohol” had been consumed.